Enjoy the best inspirational, motivational, positive, funny and famous quotes by A.A. Milan. Use words and picture quotations to push forward and inspire you keep going in life! Once Pooh asked pensively… How does one become a butterfly? 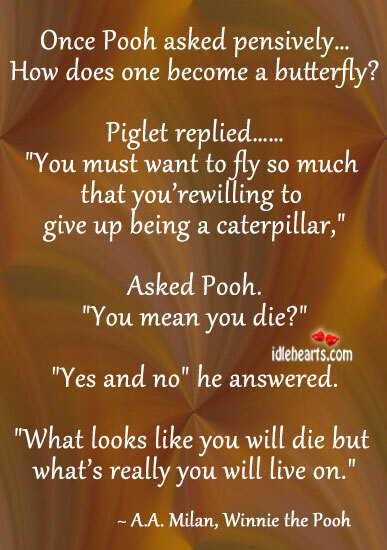 Piglet replied…… "You must want to fly so much that you’re willing to give up being a caterpillar," Asked Pooh. "You mean you die?" "Yes and no" he answered. "What looks like you will die but what’s really you will live on."